West Windsor, N.J. - The outrageously funny, highly irreverent Broadway hit, "The Producers - The Mel Brooks Musical," will be presented by Pierrot Productions at Mercer County Community College's Kelsey Theatre. The curtain rises Fridays, Nov. 13 and 20 at 8 p.m.; Saturdays, Nov. 14 and 21 at 8 p.m.; and Sundays, Nov. 15 and 22 at 2 p.m. Kelsey Theatre is located on the college's West Windsor campus, 1200 Old Trenton Road. A reception with the cast and crew follows the opening night performance on Nov. 13. Pierrot Productions will unleash its own brash take on Mel Brooks and Thomas Meehan's adaptation of Brooks' 1968 film of the same name. Down-on-his-luck Broadway producer, Max Bialystock, and his timid accountant, Leo Bloom, hatch a scheme to produce the worst musical in Broadway history, thereby swindling investors out of millions of dollars. When their sure-to-offend musical becomes a surprise sensation, they they find themselves looking down the path to financial ruin - and prison!. At the center of this insane adventure is the emotional journey of two very different men who become friends. The original production, starring Nathan Lane and Matthew Broderick, opened on Broadway in 2001, winning a record-breaking 12 Tony Awards. Known for its ribald adult content and off-color humor, the show is one of the few musicals to win in every category for which it was nominated. 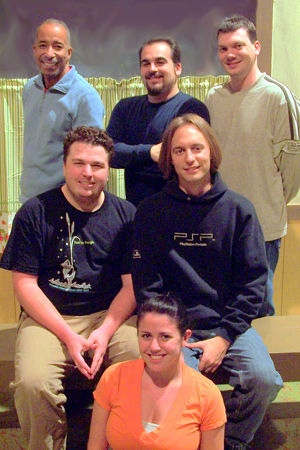 Cast members include (left to right, front to back): Melissa Rittmann as Ulla, John Zimmerman as Max Bialystock, Jim Petro as Leo Bloom, Allwyn Baskin as Carmen Ghia, Mike Schiumo as Roger DeBris, and Kevin Palardy as Franz Liebkind. The talented cast features headliners John Zimmerman as Max Bialystock, Jim Petro as Leo Bloom, Kevin Palardy as Franz Liebkind, Melissa Rittmann as Ulla, Mike Schiumo as Roger DeBris, and Allwyn Baskin as Carmen Ghia. Ensemble members include Stephen Anzuini, Lee Benson, Judy Berwick, Amy and Tom Bessellieu, Mike Fabian, Susan Fowler, Joe Kraher, David Nixon, Jaci D'Ulisse and Eric Wishnie. Dancers include Haley Ackermann, Jeffrey Branin, Caroline Fabian, Johnny Ragazzo, Dominick Sanelli, Talia Shumsonk, Kate Skelly, Dani Tucci-Juraga and Stephanie Venanzi. The show is directed by Pete LaBriola, with choreography by Kat Ross, musical direction by Lou Woodruff, and vocal direction by Pam Sharples. Tickets are $16 for adults, $14 for seniors, and $12 for students and children. Free parking is available next to the theater. Tickets may be purchased online or by calling the Kelsey Box Office at 609-570-3333. Kelsey Theatre is wheelchair accessible and provides assisted listening devices upon request.